On April 5th, 1913, soccer leaders from around the country convened to officially establish the “United States Football Association” (today known as the U.S. Soccer Federation). Over one hundred years later, we can see where we have been and where we are going, in terms of soccer on a global scale. While United States sports fans seem to be holding steadfastly to their traditional roots of American football, basketball, and baseball, soccer has been making a significant jump in viewer ratings and popularity. Viewer ratings for the 2010 World Cup were just about double from the 2006 World Cup, and the England vs. USA game became the highest-rated U.S. Men’s National Team game since 1994. This year, the USA vs. Mexico World Cup qualifying match in Columbus, Ohio had a tumultuous and roaring crowd, which refutes the notion that soccer hasn’t “stuck” in America. The Men’s National Team was appreciative of the atmosphere at that game, offering a beacon of hope for the popularity of soccer in the United States. “Ten years ago, we wouldn’t have had an atmosphere like this, our sport is growing and I think everybody’s excited to have a chance to have a world cup in Brazil. I think that’s the best place to ask for to have a World Cup and we’re excited to go”. —Landon Donovan reacts to U.S. qualifying for World Cup. With the World Cup 2014 on the way, we can only hope that the progression in popularity of soccer in the U.S. continues in its exponential growth. When you think of the dominant forces in American sports, basketball, baseball and football are the first to come to mind. The “soccer fever” seems to be fervent all around the globe, and yet it still seems to lack the same amount of fervor as seen around the world. Nonetheless, in recent years, this “fever” has been hitting America harder than ever before. The Women’s World Cup in 2011 broke records in terms of television viewership. The iconic stars of that World Cup—along with the collaboration of social media venues—allowed the entire nation to rally behind this talented team. The finals of that World Cup became ESPN’s most-viewed and highest-rated soccer match ever. We can only hope that this is an indication of what the nationwide support and atmosphere will be like for the 2014 World Cup. USA’s World Cup involvement has been a turbulent ride, for both players and fans alike. The American Men’s National team made it the farthest in U.S. history (still to this day), during their first World Cup ever in 1930. This third-place finish in Uruguay, made the U.S. first non-European or South American team to take the podium at the World Cup. Twenty years later, during the 1950 World Cup in Brazil, the United States staged one of the greatest upsets in soccer history, when they defeated a powerhouse England squad in a 1-0 thriller. While the United States did not continue on during this World Cup after a loss to Chile, this was still a World Cup that would go down in history for the United States. After the Americans’ triumph in 1950, the United States would miss every World Cup for the next 40 years before making their return to the global stage at the 1990 World Cup in Italy. A year later, the U.S. Women’s National Soccer Team returned home to the States with the first-ever World Cup title. They went on to place third in 1995 before capturing the title again in 1999 after one of the most memorable penalty-kick shootouts in World Cup history at the Rose Bowl in Pasadena, Calif. For the Men’s National Team, they were able to reach the knockout round for the first time since 1930 during the 1994 World Cup, hosted on their home turf in the United States. After disappointing results in the 2006 and 2010 World Cup, we hope that, like the England vs. U.S. game in Brazil in 1950, the World Cup in Brazil will bring new beginnings for the U.S. Men’s National Team. United States men’s professional soccer is comprised of three tiers: Major League Soccer, the North American Soccer League and the United States Soccer League. The top league within the United States is Major League Soccer (MLS). There are 20 teams within the MLS. The league plans to expand to 22 teams by 2017 and 24 teams by 2020. After two previous professional leagues, the NASL and WUSA, succumbed to deteriorating funds, the MLS currently still stands, but with numerous foibles of its own. The United States has greatly suffered on a global scale due to the lack of a strong national league backbone. The MLS does not receive nearly enough media coverage—nor do Americans demand the coverage as much as needed—in order to be as successful as national football leagues around the world. In current years, quality of play in the MLS has improved greatly, but the lack of fandom and high salary (comparable to that of other national soccer leagues around the country) still make it difficult for the league to attract most of the world’s top talent. 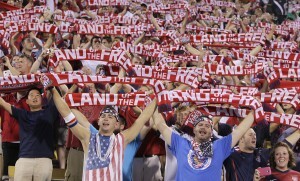 “Dos a cero… dos a cero!”, the boisterous crowd roared at the U.S. vs. Mexico qualifying match in Columbus, Ohio. Continuing their “dos a cero” tradition from 2001, 2005, and 2009, the U.S. Men’s National Team came out with a vengeance against “El Tri”. After an unpredictable and precarious World Cup history, the United States clinched their seventh consecutive World Cup qualification for the 2014 World Cup in Brazil. The United States would then go on to beat Panama in the final minutes of the game, helping Mexico secure their own spot in the World Cup. From there, the United States went on to finish with 22 points, with Costa Rica second, with 18 points. With their spot secured and an unfortunate draw into the “Dreadful Group of Death,” the United States team can only hope that they are prepared to deal with the arduous task of battling against some of the world’s best football teams. However, who will suit up for the USMNT is an entirely different story. Here in this blog, we will trace the history of soccer in the United States, and provide readers with a guide to American soccer for the World Cup 2014 in Brazil. For more information about U.S. soccer or the 2014 World Cup please check out the following subpages below. How to cite this page: “The United States and the 2014 World Cup,” Written by Matt Darlow, Julianna Miller, Bryan Silverman and Dan Carp (2013), World Cup 2014, Soccer Politics Blog, Duke University, http://sites.duke.edu/wcwp/world-cup-2014/usa-soccer-and-world-cup-2014/ (accessed on (date)). Kennedy, Bruce. “Rising World Cup Ratings: Soccer Fever Hits America”. I would like to edit this article for my spring 2015 project. I think another interesting piece of information would be the surge of American business owners of foreign teams, especially in the premier league. American’s own 6 of the 20 teams of the premier league, including 3 of the top teams in Manchester United, Liverpool, and Arsenal. I did a post on this earlier, but I think it’d be interesting to tie in the effects of American ownership on both developing the soccer culture in the U.S. and making foreign nations aware of the U.S. as a soccer nation. I really like the layout of the introduction page as well as all the subpages. It’s well written and visually appealing as well. However, the footnote links at the end of sentences on this page (as well as a few of the subpages) don’t link to anything. Maybe this can be fixed on the html code? Otherwise, it’s a little bit confusing because a link is available but it doesn’t take you anywhere. This intro pages is nicely done, though Elena is right — some comment on the sad fate of the U.S. in the draw would be great: perhaps you can use that to connect some of the many great threads in your pages. Hi guys, just a suggestion regarding yesterday’s results in the World Cup draw — perhaps you could comment about the unfortunate situation of the the US being in group G, how people have been reacting angrily/negatively to this result, and what your opinions on the situation are. Other than that, really great job on your pages!